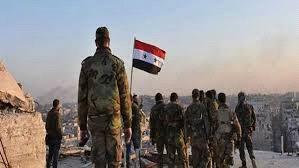 AMMONNEWS - The official Syrian flag is again fluttering on the ground zero, a triangle of Syrian territory slicing between Jordan and the Israeli-occupied Golan Heights. In a trip for Xinhua and other media outlets to the southern province of Daraa Wednesday, reporters were taken to the ground zero, otherwise known as the Island, or Triangle. This triangle is located in the far western countryside of Daraa, the birthplace of the Syrian war, which was recently recaptured by the Syrian army. It is a high ground with a Syrian flag raised at its entrance. Turning right, an Israeli observatory is spotted from a distance on the Golan Heights; looking the other side, the Jordanian territories are seen. During the crisis, the Syrian army has almost lost all border points, except for a crossing with Lebanon. The Syrian government has repeatedly charged that weapons, munition, and fighters were being smuggled into the country from the loose border points that had fallen to the rebels. Capturing the borders also indicates that the Syrian army is gaining the upper hand in the Syrian war, after almost securing the southern region safe for a few pockets controlled by the Islamic State (IS) in the eastern countryside of Sweida province. Back to the ground zero, the Syrian soldiers were seen standing guard looking both ways to Jordan and the Israeli-occupied territories. A Syrian officer told Xinhua without giving his name that the achievement is part of a greater goal that army is working to achieve. "The importance of this achievement emanates from the greater goal of liberating all Syrian areas and restoring the historic right of the Syrian army to capture the occupied territories," he said. The officer reiterated the importance of the ground zero, saying "this area is considered as the ground zero as it is the link between the territories of Syria, Jordan and the Golan Heights." It also links the Yarmouk Valley on the Jordanian side with the Ruqqad Vally on the side of the Golan Heights, he said. The officer, meanwhile, stressed that the ultra-radical groups were hunted down by the army after fleeing their positions. "The foreign-backed terrorist groups were defeated in this area and some of them fled to the Yarmouk basin and the Ruqqad valley, but those areas were combed and the terrorists were defeated," he said. On the road, some washed out rebels' flags were seen as well as rebels, who decided to reconcile with the government. Russian vehicles and posts were seen with Russian flags flattering at their entrances. Some of the rebels in the villages in the western countryside of Daraa were fully hooded, while others were seen with rifles. The Russian-backed reconciliation deals went hand in hand with the large-scale campaign in Daraa and Quneitra. Those deals allow the rebels, who refuse to reconcile, to leave for rebel-held areas in northern Syria while granting amnesty to others who hand over their heavy weapons and embark on the reconciliation process. Some reports said the Russian side has given the rebels, who want to reconcile, six-month period to settle their situation and complete the reconciliation process with the government forces. Now, the Syrian army is fighting IS in the desert region in the eastern countryside of Sweida, making progress in the fight against the remaining IS pockets there.